Do you like taking care of people? Interested in medicine or preventing disease? Fascinated by equipment used in hospitals and doctor’s offices? If so, health care may be the field for you. There are more than 200 health care professions other than doctors, nurses and dentists. Whether you like working with people, computers or in a lab, there are opportunities for you in one of the region’s hottest and largest career fields. The health care industry employs more people than any other industry in Mecklenburg County, with more than 111 health care organizations in the Charlotte area. 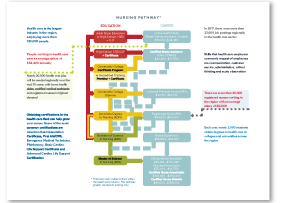 If you’re interested in nursing, check out our certified career pathway to learn what skills and training are needed. Discover which pathway you can follow from high school level to a four-year college degree and everything in between. 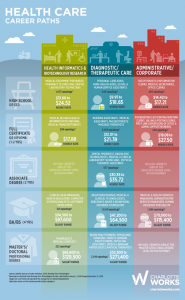 Our Career Ladder outlines each career path available in the Health Care industry for every level of education. Download the career ladder to discover where your career in Health Care can start today!